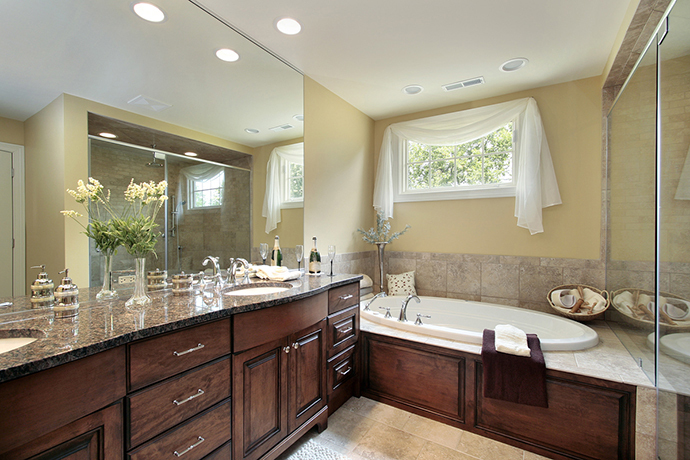 Whether you want to remodel an existing bathroom or build one from scratch, JP Moore can handle it. With over 25 years of experience we have some of the best craftsman in the business. We can install any kind of tile, marble, or granite in any configuration you want. We will work with your ideas and designs while keeping in mind functionality and practicality. We can help you in areas that take years of experience to understand such as proper ventilation to prevent mold growth. People with mobility issues can get custom built countertops, sinks, tubs and showers to ensure ease of use. 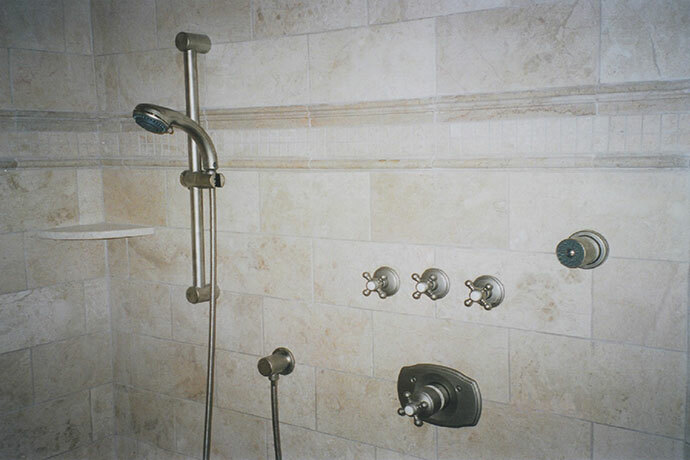 Wheelchair accessible showers are also available, which are much safer for those with disabilities. Even light switches, doorknobs and electrical outlets can be repositioned to allow for easier access. Set the right mood, and add a vibrant and lively look with the right bathroom paint color. Receive ideas and expert application of your bathroom paint. Where does your shower take you? JP Moore can replace your standard shower with body jets, that is sure to take you away. You in-home spa. JP Moore can install it for you without breaking a sweat, turn your ordinary shower into a relaxing, steam showers haven. Relax, and ease muscle, and joint pain. A jacuzzi can be a great way to treat sore muscles, and improve blood circulation. Lower blood pressure, and rest in a new hot tub. JP Moore can install your new hot tub, and you can enjoy all the health benefits. A bathroom that is cramped with items, makes it hard to relax after a hot shower. Expanding your bathroom benefits your family’s comfort as well. 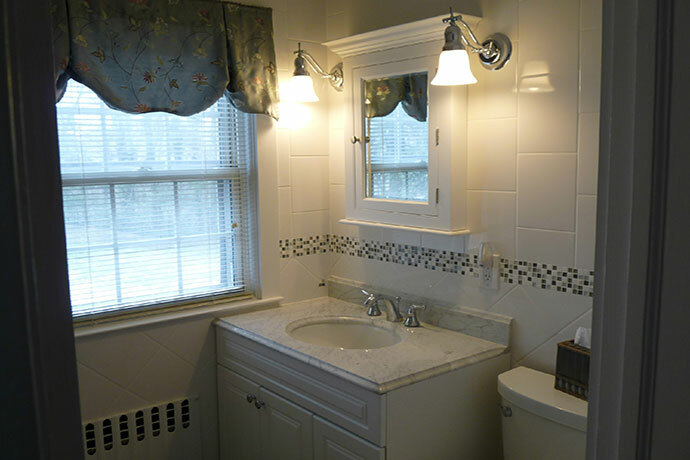 Below are recent bathroom remodeling projects from throughout Westchester, Rockland, and Fairfield Counties. 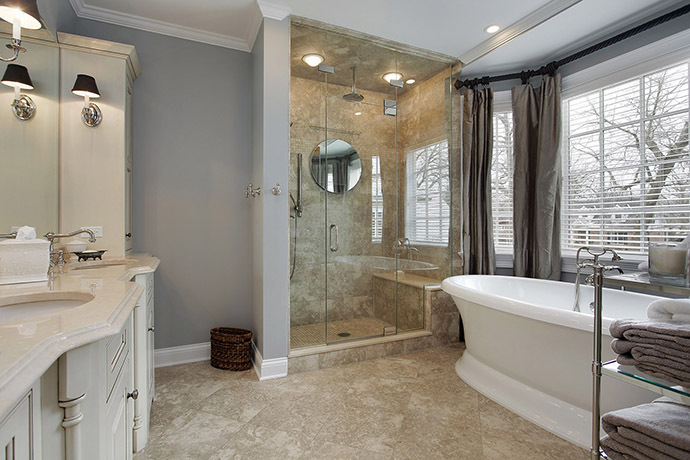 This complete bathroom remodel in Scarsdale, NY features a standing oval tub and seated shower. The white marble countertop looks excellent with a cove ogee edge. This choice of porcelain tile is simply amazing. 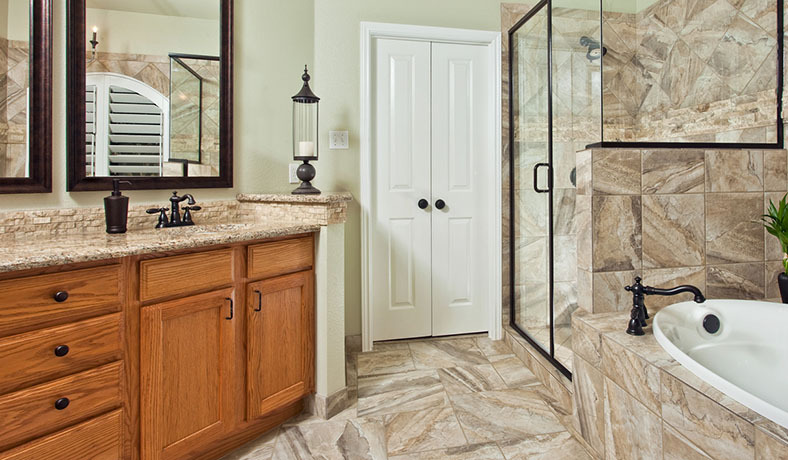 The raw stone look gives this bathroom remodel an exotic feeling. The choice of honey oak cabinerty is excellent for that extra pop from the dark tile. 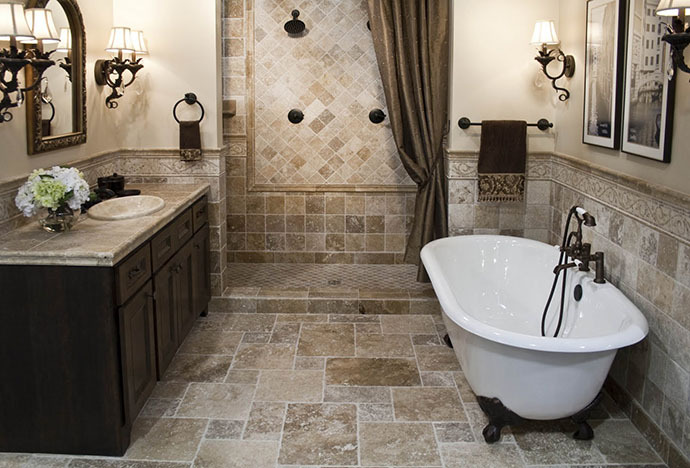 Having a beautiful bathroom in your basement can be wonderful for getting away and relaxing. This bathroom remodel in Greenwich, CT features a jacuzzi, stand up glass shower, and a large dual sink marble countertop. The choice of porcelian tile is a great way to have a stone look without the cost. The floor tile pattern resembles a common pattern of stone floor covering. 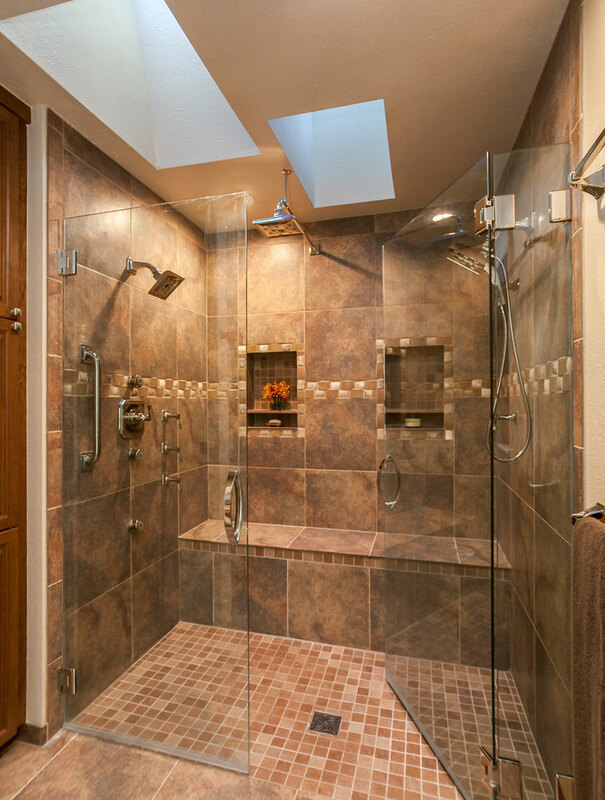 Along with the waterfall shower configuration, this bathroom remodel has a very rustic outdoor feeling. When you have space like this Danbury, CT bathroom, you can do pretty much anything. With the recessed ceiling to the large windows, this bathroom has a huge open airy environment. Laying your floor tile on a diamond pattern makes your bathroom look even larger. Having a bathroom remodeled in a basement can sometimes be a daunting task due to size constraints and proper ventilation. This bathroom remodel in Dobbs Ferry, NY shows that with proper design decisions you can have a fully functional beautiful bathroom. Having a his and hers dual sink setup makes getting ready in the morning quick and easy. JP Moore Home Improvements is available in over 125 Cities in the Tri-State area. 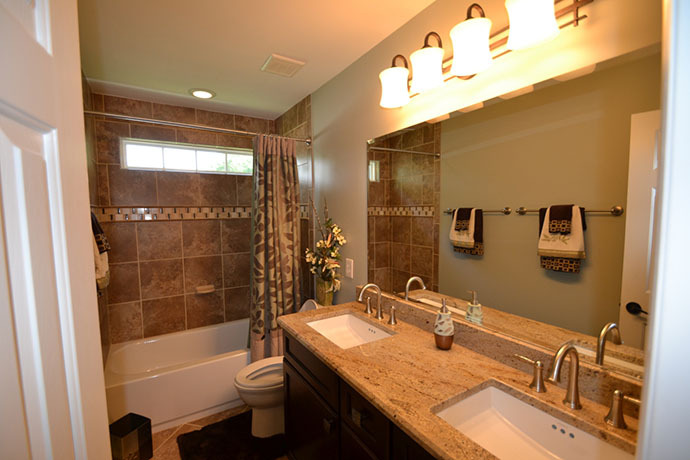 Contact us today for a Free Estimate on your next bathroom remodeling project. 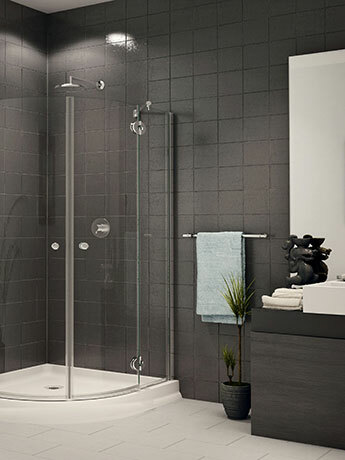 When you’re looking at shower styles, it’s easy to become overwhelmed by the sheer number of ideas available, especially as new technology is introduced and the home design market evolves to embrace it. However, that doesn’t mean that all of the ideas are useful for a modern bathroom remodel, or that they’re the right option for you. 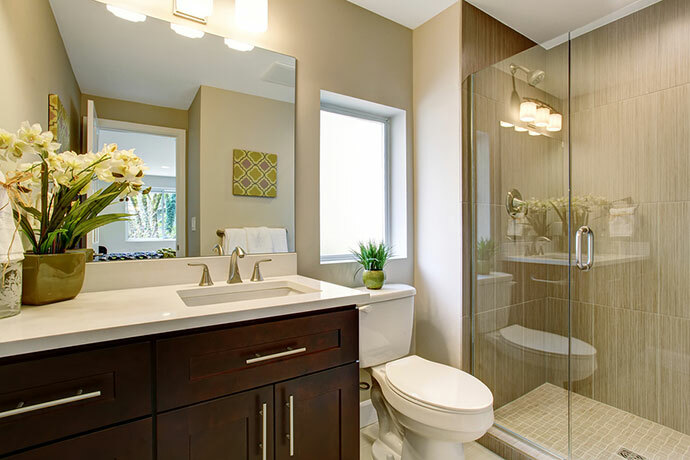 To narrow down the field, take a look at some of the most useful design ideas out there for this particular aspect of your bathroom. Most of the rooms in your house are community areas shared with family, so it can be hard to find a place where you can get away to relax and pamper yourself. A bathtub is quintessential for a spa-like experience in the bathroom, and can make even a small space feel grand and luxurious. 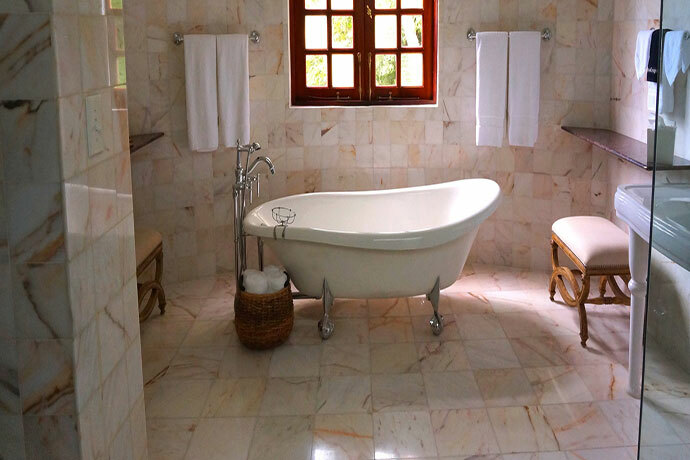 Focusing your bathroom remodel on a quality bathtub will make the most of however much space you have to work with. Is it time to update your outdated master bath? If so, it’s time to start thinking about the style and features to implement in your bathroom remodel. More than ever homeowners are investing in renovations to transform their old bathroom into a spa oasis. Features like large open showers, soak tubs and saunas are among some popular master bathroom trends this year. Remodeling a bathroom that’s not only outdated, but small poses some challenges. However, with some creativity and modern design techniques a beautiful bathroom oasis can be implemented into your small space. There are just a few things to keep in mind before going into this renovation: space, functionality and impact. If you are like most homeowners, you weigh every decision you make by considering the return on investment it could provide for your home. Some investments are better than others, but when it comes to additions, few provide the value that a bathroom addition can. Buyers who invest in a bathroom remodel, in fact, are reported to rate their satisfaction as a 10. If you are trying to decide whether it is right for you, however, these are a few of the factors to keep in mind.